There will be much more than just things going bump in the night during this years Halloween season at Disneyland Paris. Here is the official Press Release with all the scary details. From 1 October to 2 November 2014, Disneyland Paris is the place to be to meet the Halloween gang of Disney Villains. Every day, Maleficent will bring together the Disney Villains in a cheerfully ominous atmosphere, promising Disneyland Paris guests encounters to die (laughing) for. The Sleeping Beauty Castle Courtyard will be transformed to welcome the good Disney Villains who will take mischievous pleasure in taking over Disney’s Halloween Festival. And that’s not all! During this delightfully frightening month, ghosts and “Disney’s Funky Pumpkins*” will take possession of Main Street, U.S.A., astonishing pumpkins will take over the flowerbeds in Central Plaza and Frontierland will be transformed into an autumn garden, where sunflowers and pumpkins will take centre stage. Finally, Mickey and friends will offer guests a special Harvest festival-themed cavalcade, not far from Minnie’s Halloween Costume Corner or the incredible candy-making machine invented by greedy Goofy, all designed to ensure Disney’s Halloween Festival is a laugh a minute! With Maleficent in the leading position, the Disney Villains will be the unmissable stars of Disney’s Halloween Festival. Every day, the Disney Villains will be happy to have their photos taken with guests to immortalize this fearsomely funny occasion forevermore. Together with Maleficent, the Disney Villains will parade around Central Plazato welcome guests. In the Sleeping Beauty Castle Courtyard, Maleficent and her accomplices will create an unmissable spectacle, which will be the place to be seen! 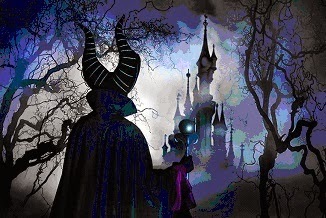 This year, Maleficent will cast a spell on the Sleeping Beauty Castleand the Disneyland Parkand will invite some of the Disney Villains to join her in the Castle Courtyard. Maleficent, surrounded by her friends, the Disney Villains, will take over the place — it has now been invaded by imposing brambles, which guests will be able to pose in front of, next to the Disney Villains. That is how huge brambles mysteriously appear in the Castle Courtyard. Shaped like the famous horns of Maleficent herself, these brambles form the outline of an imposing dragon. As night falls, the bramble will take on a more disquieting look, immersing guests in a universe of bright, unsettling colours. To celebrate Halloween and to provide guests with a unique party, Mickey and friends will offer guests a cavalcade specially dedicated to the Harvest festival, and have naturally been inspired by the autumn and Harvest theme. Several times a day, Mickey and friends will parade in front of Sleeping Beauty Castle and along Main Street, U.S.A., surrounded by dancers wearing autumn colours. This year, the lovely Daisy will open the cavalcade. The Three Little Pigs and Horace will join Mickey’s Halloween Celebration on their brand new float “Raise the Rafters!”. Surrounded by owls, black cats, spiders and bats, the Three Little Pigs, Horace and Clarabelle will dance to country music in front of their farm. A tree and an enchanted mushroom will come to life as if by magic. The ghosts of the former residents of Main Street, U.S.A. will use Halloween as the perfect opportunity to make their grand appearance. Delighted to be able to make an appearance during Disney’s Halloween Festival, they will take over Main Street, U.S.A., trying to blend into the scenery. The Park’s apprentice ghost hunters will be invited to unmask them, armed with their cameras. Passionate about sewing and fashion, Minnie will invite guests to discover her amazing sewing workshop, specially created for Halloween. An extravagant, colourful world where everyone is encouraged to let their imagination run wild. Minnie, in her fabulous Halloween-inspired dress will no doubt jump at the opportunity to pose with her admirers. Halloween would not be the same without bonbons and spells. For that reason, Goofy has designed and created a truly amazing candy-making machine to dazzle those with a sweet tooth, young and old! Fans of bonbons and Goofy will not miss the opportunity to stop in front of this astonishing machine. Goofy might even join them to make sure everything is in good working order. A moment to treasure and a chance for everyone to persuade him to share his confectionery secrets! The famous couple created by Tim Burton will be at Disneyland Paris during Halloween for a mortally enchanting encounter. The set recreates the universe of the film The Nightmare Before Christmas, and Jack and Sally in person will welcome those who will be courageous enough to meet them. A reproduction inspired by the universe of Tim Burton, Jack and Sally’s Cemetery is a unique place. Disney PhotoPass+ allows guests to collect all their souvenir photos taken on rides or with Disney Characters by Park photographers at photo locations in high definition in a virtual portfolio. The photos are also available on a dedicated website (www.disneyphotopass.eu) and on a mobile app that enables guests to download them, share them on social networks and even purchase personalised photo products (photo albums, mugs, calendars etc.). Disney’s Halloween Festival will therefore be the ideal time to capture the best poses next to the Disney Villains. Disney’s Halloween Party: the grand finale on 31 October! The now famous Disney’s Halloween Party** will be held on 31 October 2014 in Disneyland Park. A unique experience to share with family or friends from 8.30 pmto 1 am. Disneyland Parkwill reopen its doors after dark and guests will see it as they have never seen it before — in a more mysterious atmosphere than ever, with unexpected animations, terrifyingly delicious surprises and a “hellish” atmosphere. The moon will bring out the ghosts, Disney Villains and other creatures for the party, who are all ready to play their tricks around the most mysterious of places. After enjoying the many attractions Disneyland Park has to offer, guests will be able to immerse themselves in the magical extravaganza of the Disney Dreams®! night-time show. Halloween will be the perfect occasion to test guests’ vocal chords on rides that will make them tremble with fear! With The Twilight Zone Tower of TerrorTM, Rock ’n’ Roller Coaster with Aerosmith, Indiana JonesTM and the Temple of Peril, Crush’s Coaster® and Space Mountain: Mission 2, Disneyland Paris will be the place to be to test the limits of the most overwhelming fears. The Disney Villains have chosen the right occasion for their largest gathering — Disney’s Halloween Festival 2014 has become autumn’s unmissable event. Tom Wolber to become Président of Euro Disney S.C.A. Philippe Gas named General Manager of Shanghai Disney Resort, Tom Wolber, from Walt Disney World Resort, replacing him at Disneyland Paris. Euro Disney S.C.A. today announced the nomination of Tom Wolber to the position of Président of Euro Disney S.A.S., the management company of both Euro Disney S.C.A., the holding company, and Euro Disney Associés S.C.A., the operator of Disneyland® Paris, in replacement of Philippe Gas named General Manager of Shanghai Disney Resort. “One of our greatest assets is the global strength of our teams,” said Tom Staggs, chairman of Walt Disney Parks and Resorts. “Both Philippe and Tom are seasoned Disney veterans with a tremendous combination of leadership skills, business acumen, and international experience that will help ensure that we carry on our legacy of creating unforgettable experiences for our guests. They bring an incredible depth of operational experience to their respective roles and are well positioned to contribute to the future success of Shanghai Disney Resort and Disneyland Resort Paris“. “On behalf of all Supervisory Board members, I would like to thank Philippe for the excellent collaboration we had together and for his personal involvement in Euro Disney during the last 6 years”, said Virginie Calmels, chairman of Euro Disney Supervisory Board. “We are very proud that The Walt Disney Company has chosen Philippe, a French top executive, to lead a huge and strategic project such as Shanghai Disney Resort. We also welcome Tom and wish him a lot of success in his new function“. Tom is German and speaks 4 languages: French, Dutch, English and German. He returns to Disneyland Paris, which he helped to open in 1992 and brings more than 20 years of wide-ranging operations experience including leadership positions at Disney Cruise Line, Disney Vacation Club and both Walt Disney World Resort and Disneyland Paris. He most recently served as the head of Walt Disney World Resort and Transportation Operations, overseeing all of the 28 resort hotels and the property’s extensive transportation network. He has also overseen a number of complex expansion projects, including the successful launch of the Disney Dream and Disney Fantasy and was instrumental in the Disney Springs master plan and the continued growth of Walt Disney Parks and Resorts’ sports business.